Frightful Friends Tealight Holder Set – More fun than frightful, this trio makes your home Halloween happy. 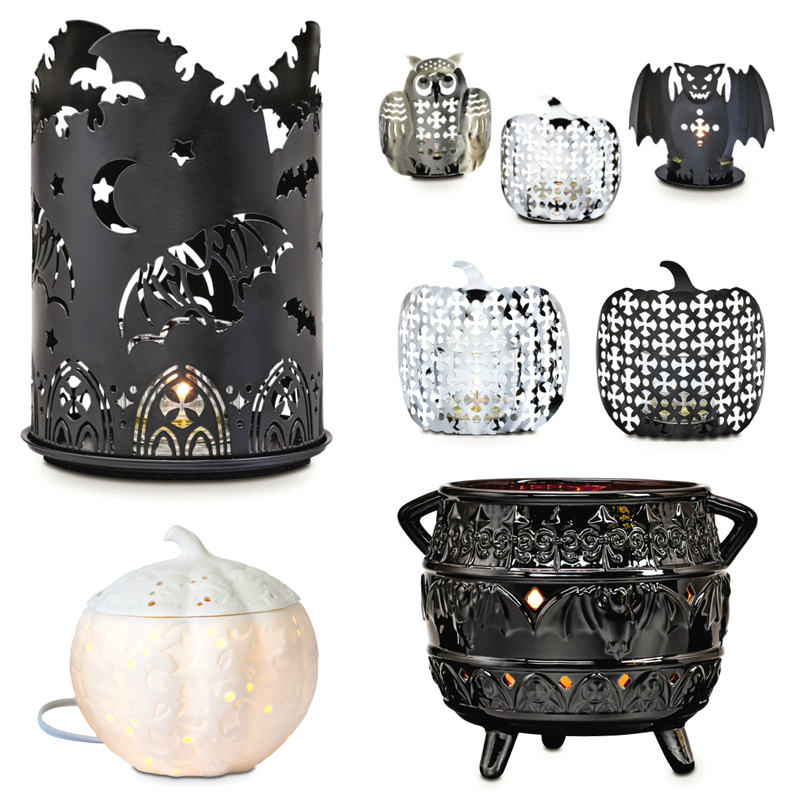 Includes three pierced metal holders: shiny silver tone pumpkin, matte black bat, brushed brass tone owl. Pierced Pumpkins Votive Pair – Favorite autumn icon gets a modern, metallic treatment. Pair of pierced pumpkins in two different finishes: matte black and shiny silvertone. Includes two glass votive cups to hold votives or tealights. Glowing Pumpkin ScentGlow™ Warmer – Welcome autumn’s arrival with a cheerful sculpted shape and housewarming scent. Porcelain electric warmer radiates a soft glow while releasing the fragrance of Scent Plus® Melts, sold separately, placed in the ceramic warmer dish. SPECIAL OFFER! Get two packs of Scent Plus Melts or Novelty Melts for free when you buy any ScentGlow Warmer, from the 1st to the 31st of October. Spellbound Cauldron Jar Holder – Cast a spell with your favorite fragrance in our gothic witches’ cauldron. Diamond-shaped cutouts flicker with bewitching candlelight. Holds a 3-Wick Jar, sold separately. GloLite by PartyLite® Hocus Pocus™ Scented Jar Candle – The same instant, all-over glow as our popular GloLite pillars, plus a richer, stronger scent! Enjoy the magical shimmer of GloLite technology paired with our Hocus Pocus fragrance, a blend of coconut and sweet praline under the spell of citrus fruit and floral notes. Burn time: 50-60 hours. Bewitched Universal Tealight™ Candles – Intoxicating black liquorice blend is infused with juicy plums and succulent blackberries to create an addictive aromatic treat. Hocus Pocus™ Universal Tealight™ Candles – The magical scent of citrus and florals with an unexpected touch of coconut and praline. Hocus Pocus™ Scent Plus® Melts – Enjoy hours of fragrance from our most highly-scented melts. 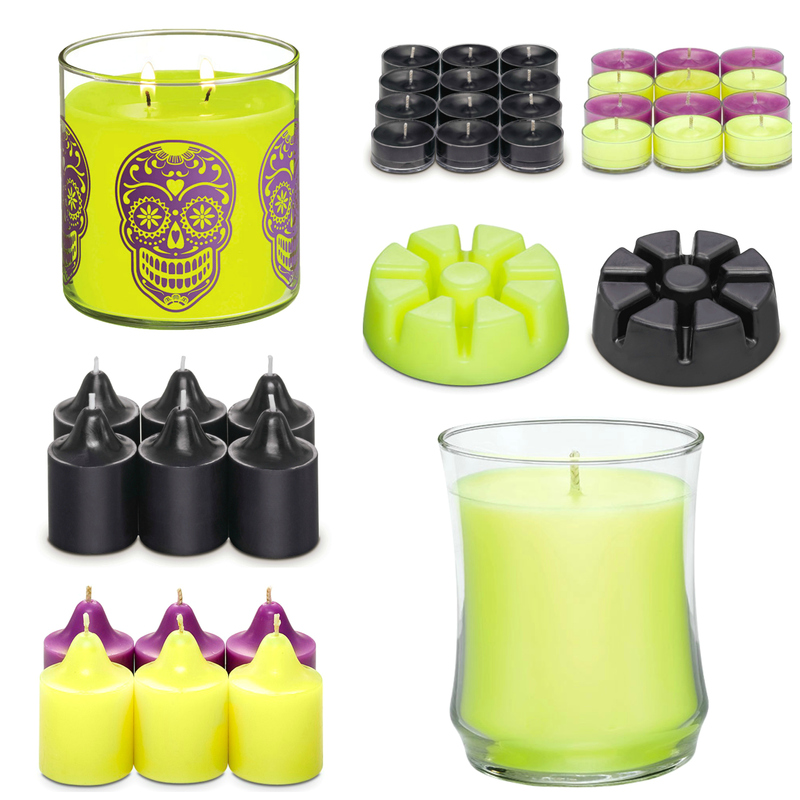 Use in our ScentGlow® or Fragrance Warmers, sold separately. Create a custom fragrance with two different melts. Each tray snaps into nine melts. Bewitched Scent Plus® Melts – Our quality melts deliver up to 60 hours of luxurious fragrance when used in our electric ScentGlow® Warmers, sold separately. Bewitched Votive Candles – Ambiance shimmers softly through liquefied votives available in all of PartyLite’s exclusive fragrances including Bewitched, an intoxicating black licorice blend infused with juicy plums and succulent blackberries. PartyLite votives completely liquefy requiring a votive holder for burning. Hocus Pocus™ Votive Candles – Coconut and praline add an unexpected twist to this mysterious blend of sugar berries, grapefruit and floral notes. It’s a magical Halloween surprise. Burn time: 8-11 hours. Hocus Pocus™ Escential Jar™ Scented Candle – The all-new Escential Jar Scented Candle for an even better candle experience! Exclusive patent-pending design features a flared opening to release more of the rich fragrance you love. Enjoy 40-60 hours of Hocus Pocus™. So what will you be treating yourself to this Halloween? Let us know in a comment below. Remember to get your orders in before October 15th so that you’ll have them before Halloween.